Mill-Max Mfg. 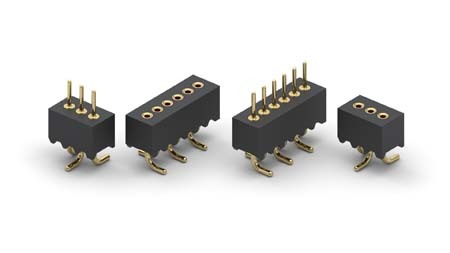 Corp.is pleased to announce the availability of its new fine pitch SMT gull wing connector series. The series comprises the 860-10-0XX-30-002000 (1mm gull wing SMT header available in 3 - 26 positions) and the 861-13-0XX-30-002000 (1mm gull wing SMT socket available in 3 - 26 positions). With a board-to-board stack height measuring less than 0.3" (7,62mm), the Mill-Max gull wing series is ideal for tight, compact spaces in which a surface mount, precision-machined connector is the preferred design choice. In addition, the diameter of the leads - .014" (0,36mm) for the socket, .015" (0,38mm) for the header - leaves a tiny footprint, saving valuable PCB space. All Mill-Max pin headers and receptacle sockets feature high-speed, screw-machined pins and receptacles manufactured to precision tolerances. Inside each 861 series receptacle is a precision stamped Beryllium Copper Mill-Max #04 3-finger contact clip with a pin acceptance range of .008" - .013" (0,2mm - 0,33mm) diameter and a current rating of 2 amps.